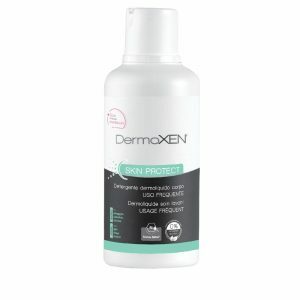 DermoXEN 4MEN is the new cleanser for the daily intimate hygiene of men, especially designed for people who attend gyms, swimming pools and others places at risk. Thanks to its cleansing action, it protects from bacterial attacks, helps prevent bad intimate odours and exerts a gentle and long-lasting refreshing action. Tribulus Terrestris: a plant known since antiquity for its various beneficial effects on people’s health. It fights against bacterial proliferation, in a natural and safe way. Biotechnological derivative of Menthol: it gives a gentle and long-lasting refreshing action. Prebiotic fibres: they favour the natural intimate balance, fighting against bad odours. For men’s daily intimate hygiene. It is recommended especially in those situations such as intense sport activity and working outside home. It is also recommended in association with pharmacological therapies. Apply a small amount of product on wet skin (press the dispenser twice) and massage gently. Rinse with clear water and dry carefully. Warning: the product is not suitable for people who are intolerant to one of the ingredients.